I like no LOVE the Steelers. It happened years ago, I was abducted by a family of Steeler fans and given the kool-aid. I haven’t been the same since, which is fine because while it may seem a bit strange to live in the middle of TN Titans country, I have crossed paths with some really cool people since adopting them as my team. 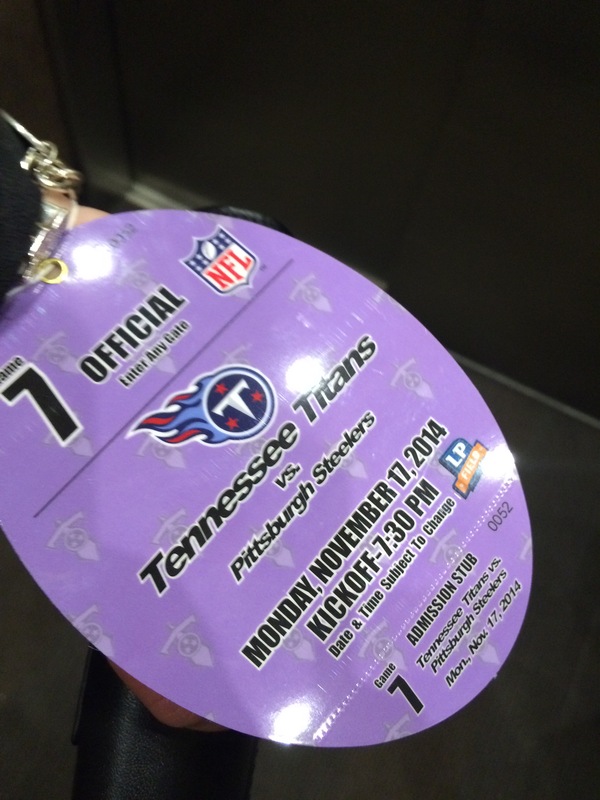 I still cheer the Titans on except when we play them. I think that is fair. So the past few years when they have played in Nashville I have gone and they have lost. . . as in, let’s find a way to really stink it up lose. I was so nervous going into last night’s game because we needed that win and my track record has been, well horrible. So here it is, a hundred below freezing, flurries, bitter wind and oh yeah, me, the cursed one. 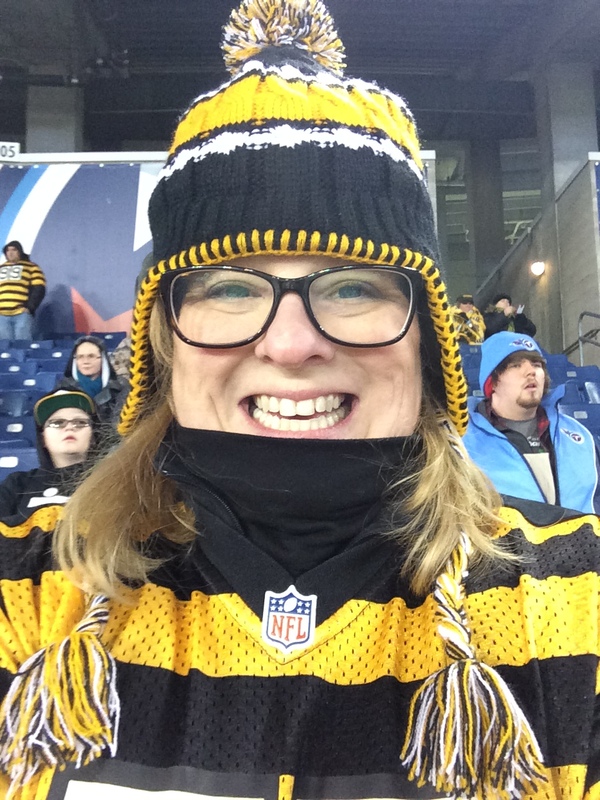 I am well aware of my track record when it comes to men and relationships and you know, I am okay with that losing streak but not my Steelers. Leave them alone. 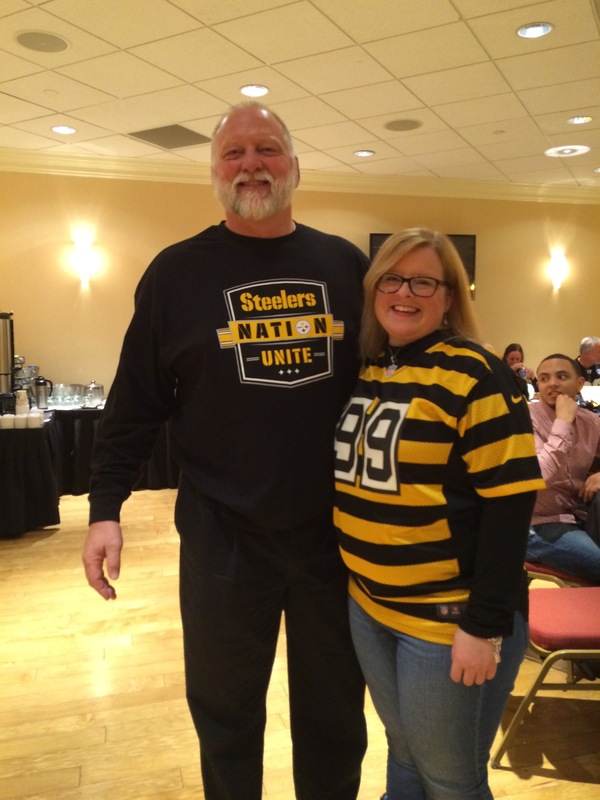 Last week I was invited to a meet and greet sponsored by the Steeler’s newest app for the organization: Steeler Nation Unite. I met Craig Wolfey (former Steeler and voice of the team) as well as some front office staffers. I caught a glimpse of the Monday Night Football team and Coach Tomlin. 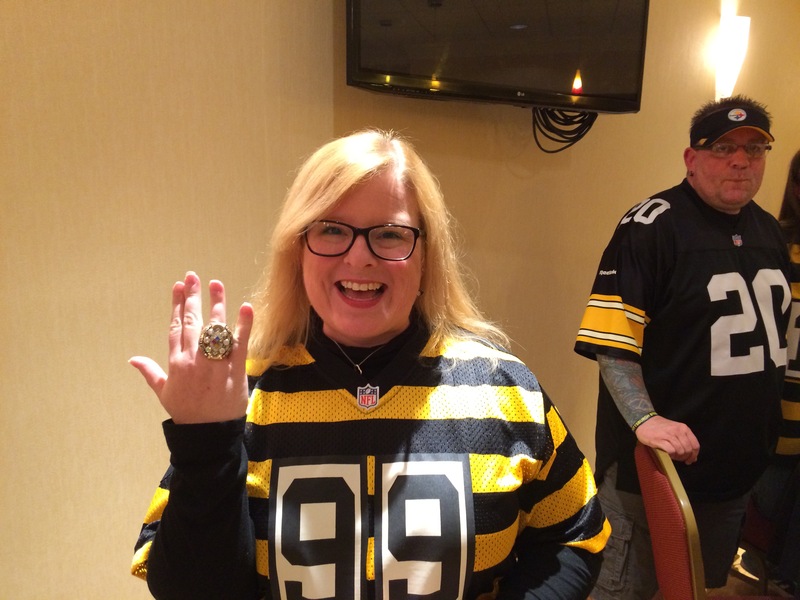 That was Sunday night and I was beyond giddy at this point because I tried on a Super Bowl Ring, got to meet other Steeler fans and geeked out on all things football. Oh this ring? It’s a Pittsburgh Steelers Super Bowl ring. . . Cool guy and some great stories. . .
Pano view of the Meet and Greet. . . I got lucky. 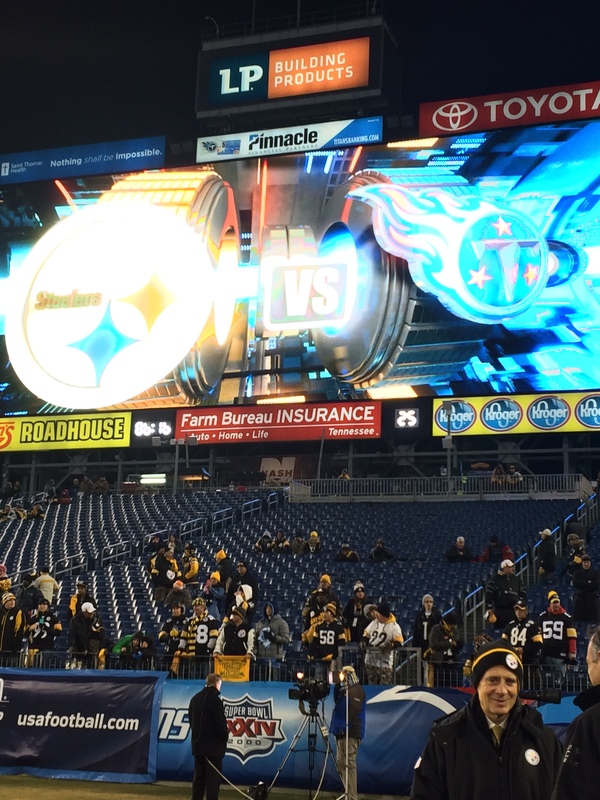 I drove home from the meet and greet dreaming of a win and a job offer from the Steelers. . . I never said I was rational when it came to my dreams. So Monday morning it was cold, snowing and did I mention cold? I layered up for work. 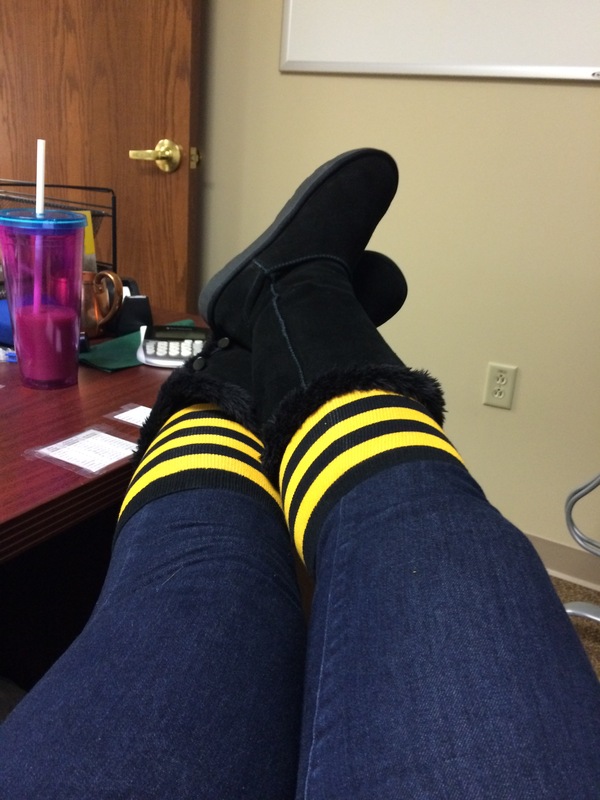 . . making sure I had my bumble bee socks on for all to see. If I thought I could get away with wearing my jersey to work, I would have trust me. The morning flew by but then at about 1:30 the clock just stopped. Ugh, longest afternoon of my life. And then I found out I got a field pass. It was better than Christmas morning around here. It was a good news/bad news type of thing though. 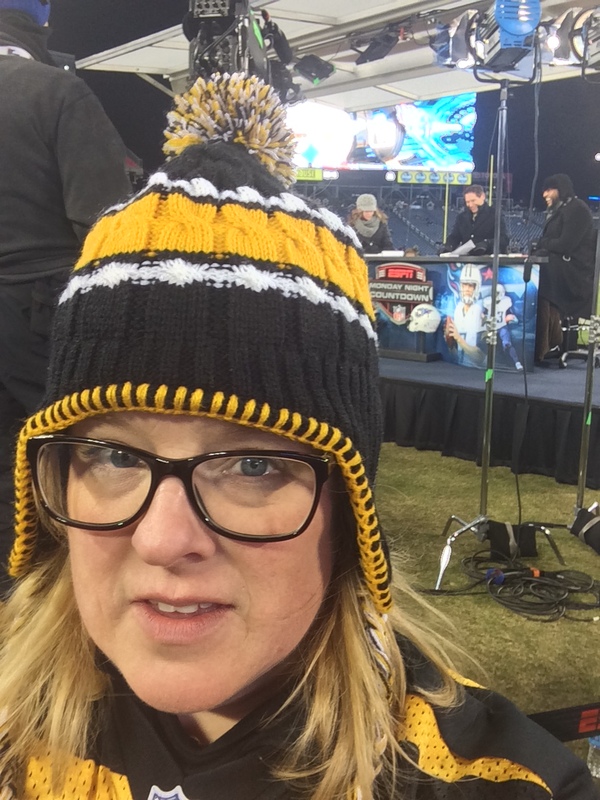 They only had one and my inner selfish football crazy girl came out and said, “oh my friend doesn’t like the Steelers so no worries, mine, mine, mine!!! !” He didn’t care, in fact he was still coming up with ways to end my life because of this very cold evening of football. My only request was that he would hold off on offing me after the game. I have priorities. I walked out onto the field and from that moment on I was overwhelmed. I didn’t know which way to look, what to take pictures of and I wanted pictures of the players but I didn’t want to bother them. So I probably looked like a fish with my mouth wide open. But it was one of the coolest things I have ever done and I got to observe how a team gets ready for the game. One of the first views when I hit the field. Oh and don’t mind me gawking. . . that’s just Mr. Rooney walking in front of me. . .
OMG! 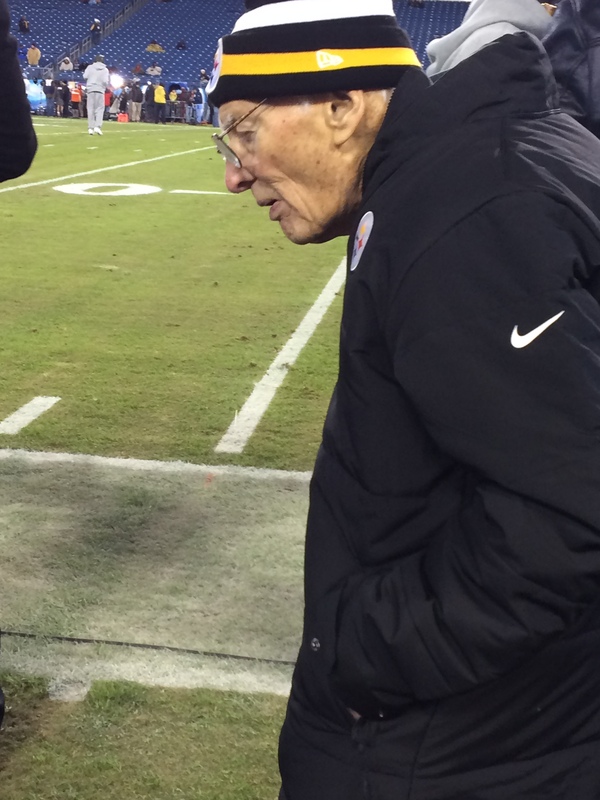 Mr. Rooney! Fan girl geeking out as the owner walks two feet in front of me. My true nerdy self got all dorky with a selfie in front of the MNF team. . . they really wanted to be in the picture. For a sports and news junkie, this just kind of sent me over the edge. Monday Night Football set right there. ..
I’m cold, I can’t feel my tush but I am beyond happy to be watching my team play and swinging that Terrible Towel. Sure it was a cold night, my friend kept thinking up ways to kill me for dragging him to the game and we hit a rough patch but it’s my team ya’ll. Like I wouldn’t be there watching them. And while the first wave of people who sat behind us were mostly Steelers’ fans, they kept spilling their beer on my jacket and their token Titans fan friend about took a head dive into our row. So it was with great joy that a group of guys ended up showing up late and reclaimed their seats behind us. They were all cute but there was one that I wanted to trip all over myself to talk to. . . translation. . . I grinned like a dork and said a handful of words to, including, “you have pretty eyes.” If anyone wondered how I have managed to stay single for so long, wonder no more. I chatted up the rest of the guys, they called me honey bee and bumble bee, teased me for my choice in football teams, swatted their Titans towels at my shoulder and bought me drinks but the one that I thought was cute I barely talked to and certainly didn’t ask him his name. But blue eyes said I looked like his best friend and that I would look better in blue instead of black and gold and I said. . . you have pretty eyes. I meant it but I also wanted to say, you have the kindest eyes ever and I am so awkward but damn, you are cute. . . are you dating anyone? I like football, hockey and can cook like nobody’s business and have the humor of an adolescent boy, wanna go out? But I just blushed, stole quick glances and gave probably some of the stupidest faces to him. All the while hopping up and down trying to stay warm. After the half they never came back, well one of them did and he said he was messaging them to come back but never heard anything. I repel men. . . see. And just when it looked like the curse was very real I told my friend I was ready to hang it up, the third quarter was almost up, I couldn’t feel my tush or my legs and my team was down. I was a sad panda. So we grabbed our stuff, I told the guy to tell his buddy thanks for the drinks and that blue eyed boy had really pretty eyes (yep, LAME) and we hauled it out of the stadium. By the way, that curse is really real cause when we got to the car, they scored a TD and by the time I got home we were up and we won. Crisis averted, my Steelers WON!!!!! 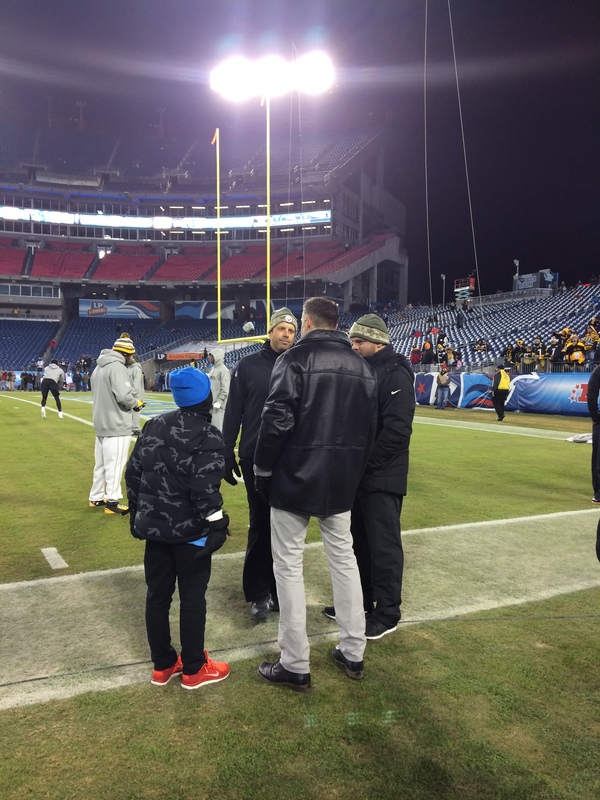 I can’t feel most of my body, I met a guy that I thought was cute (it’s been way to long) and I think I may of made a fool of myself BUT I got to try on a Super Bowl ring, meet some cool people, hang out on the field and geek out getting to see Steelers players up close and personal. Yeah, it was a good night.